And I'm back! - Reflections.. It has been two weeks since I made an appearance here. I was planning to blog daily in October, but all my plans went downhill when I fell sick. It was one of those times where “together in sickness and in health” bit held true for us. We, as a family, was sick. The good thing was at least one of us was well to take care of the other. I stayed away from my laptop and didn’t spend much time on my phone either. I was too tired to think. The guilt of not being able to write was there, but I didn’t force myself to write. Because I knew from previous experiences that this too shall pass, but an aching head will never get better without proper rest. This meant that the plans I kept making had to wait. Well, that was upsetting. But me being a strong woman stayed strong. 🙂 And here I am. I am well now and hopefully will keep well from now on. My head is thinking again, a lot than usual, without causing much pain and all those feeling of guilt for not doing anything for the past two weeks is back on strong and steady. Life is going to be like this forever, isn’t it? A mixture of happy, sad, guilt, surprises, healthy, sickness, and whatnots. I think it’s okay to be crashed with these kinds of guilts once in a while. It is up to us to make sure that we are not overrun with guilt at inappropriate times and not lose ourselves in that chaos. Plans can always be redone and can be achieved too. It is okay to take that break even if there is a pile of to-dos waiting for us. It is okay to let the plans fail once in a while. And it is okay to not feel guilty when everything goes wrong. It is okay to welcome chaos in life as knowing that it is chaos and be relaxed about it for a change. Sometimes taking it slow is the right medicine. So while I missed being here and the interactions that followed as well as reading other blogs, that was the right thing to do.I hope you noticed that I was away, well, not anymore. 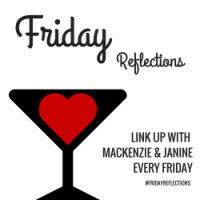 Linking with Friday Reflections FREE WRITING: Reflect and write about anything! So that explains your absence….Hope your quota of bad germs is over for the year. It always refreshes you!!! Glad you are back!! You inspired me to start writing ! Good to see you back and you are right life is like that. Ups down and thats what makes it spicier. .
Hey, get well soon and I can relate so much to this post. It’s perfectly alright to get knocked down, sit and look at things with a fresh perspective. Happens, right? Hope things are going good with you, Vishal. Good to know you are back on your feet. Congratulations on the shift. This looks awesome. I too have been thinking of shifting for quite some time. Lets see when it finally happens. Hey! Hope you’re all doing fine now? Take care! Welcome back…sometimes I believe our body tells us what our mind already knows but is unwilling to do. You obviously needed the down time and time to slow down. If it came in the form of falling ill, so be it. At least it forced you to rest. I spoke about being busy too and how that’s not really good for me. I can’t wait to slow down either.